The U.S. economy is in very good shape right now. The question is how long that will last. 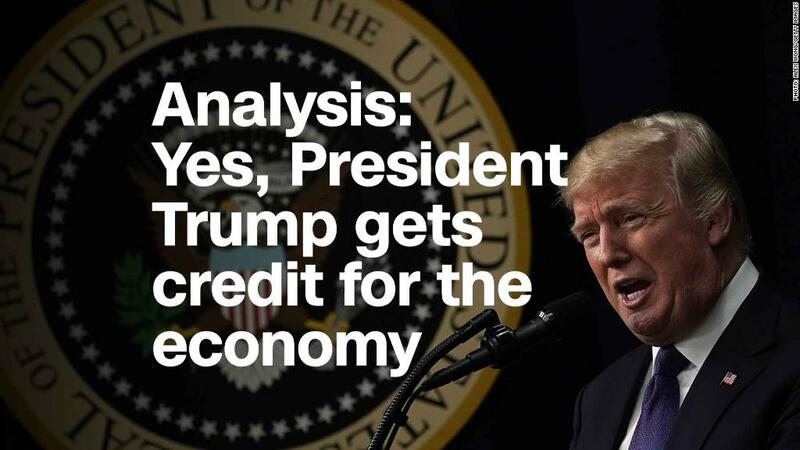 President Trump is certain to talk a lot about the strong state of the economy at his first State of the Union speech tonight. And why not? Unemployment is at a 17-year low. Consumer and business confidence are both near record highs. The stock market is regularly setting records. The current economic expansion began in June 2009 -- or 8 years and 7 months ago. If this one makes it to 10 years old next summer, it'll be the longest in U.S. history. Of course, boom times don't last forever. Economists are busy speculating about when this one will end. Recessions don't start when the economy is weak, but rather when good news and growth have reached a peak. That's when the economy can become susceptible to shocks, such as a geopolitical crisis or a market bubble, that tip it into recession. Or the economy can overheat, which can prompt the Federal Reserve to raise interest rates, which itself can bring an expansion to an end. "It's going to feel really good this year, but that's when recessions take root," said Mark Zandi, chief economist with Moody's Analytics. He's worried that a recession could start in a year or two. "When people are becoming very optimistic, that's when they take more risks and make mistakes and problems can occur." The rapid adoption of computers and growth of the internet in the 1990s led to huge increases in productivity and strong economic growth. But that growth led the stock market to record highs, causing a bubble to develop among tech stocks. Unemployment was also very low, making it difficult for employers to find the workers they needed to grow. All of this laid the groundwork for the end of that expansion. Unemployment bottomed out at about the same time that the stock market bubble burst. A year later the recession started. At the time, tax cuts, government spending on Great Society programs such as Medicare and Medicaid, as well as on the Vietnam war all pumped money into the economy. So did greater access to credit, as consumer borrowing soared. The growth lasted until the Fed's inflation fighting efforts at the end of the decade brought about a recession. This expansion started with the stimulus spending and tax cuts that passed in early 2009 to battle the Great Recession. The bailout of the auto industry that summer also helped get the economy growing again. But growth has generally been slow, but steady, ever since. In the late 1970s and early 1980s, the Federal Reserve battled very high inflation with the highest interest rates in its history. When it finally won that battle and started lowering rates, the economy kicked into gear. Tax cuts passed by the Reagan administration also fed growth. But Iraq's invasion of Kuwait in August 1990 led to a spike in oil prices, and that helped bring on a recession. Public works projects helped pump money into the economy and bring an end to the Great Depression. So did assistance programs, such as the start of Social Security. But what really got the economy moving was an increase in defense spending at the start of World War II. That growth paused when the war ended and factories had to shut down and retool from military to civilian use, which triggered a brief recession. In response to the Sept. 11 terrorist attacks, the Fed slashed interest rates as a way of supporting nervous markets. And rates stayed low for several years, which helped to spur home buying, lifting housing prices. The housing bubble eventually burst in 2006, leading to the Great Recession, which started at the end of 2007.